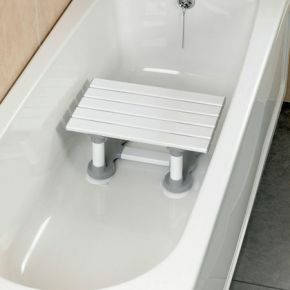 The slatted bath seat provides a strong, comfortable, quick draining seat that is suitable for both bathing and showering. The slats are fully sealed against the ingress of water and fittings are either stainless steel or plastic giving a corrosion resistant seat. Four strong suckers hold the bath seat securely in position. Suits me perfectly! Good height, and allows me to shower in the bath with shower curtain. Had a bath board, but was unable to use the curtain . This made it very awkward when water went on the floor, as with my present condition bending is not advised. The seat is a little uncomfortable - advise using flannels to sit on.